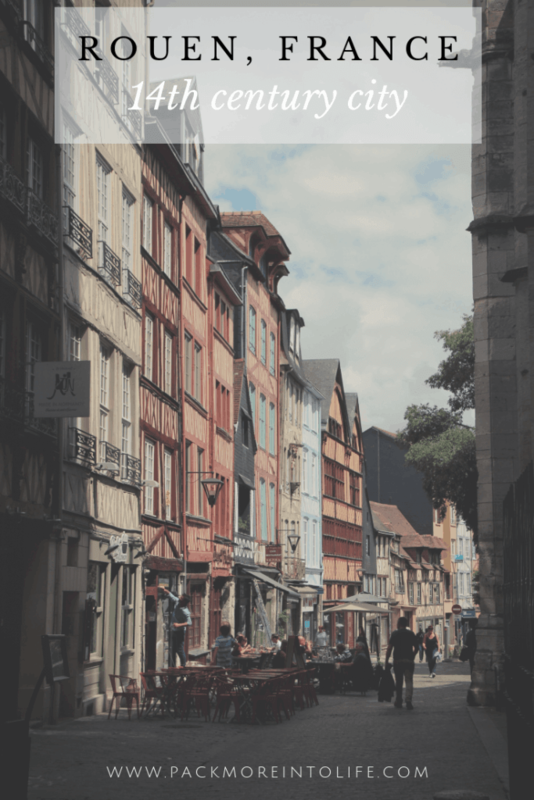 The town of Rouen is certainly one not to miss! With a beautiful gothic church, pedestrian cobbled streets with 1/2 timbered homes and the fatal site of Joan of Arc’s final resting place. It was the Regional capital during the Roman times, William the Conquer called it home and the historic core survived the bombing of WWII. 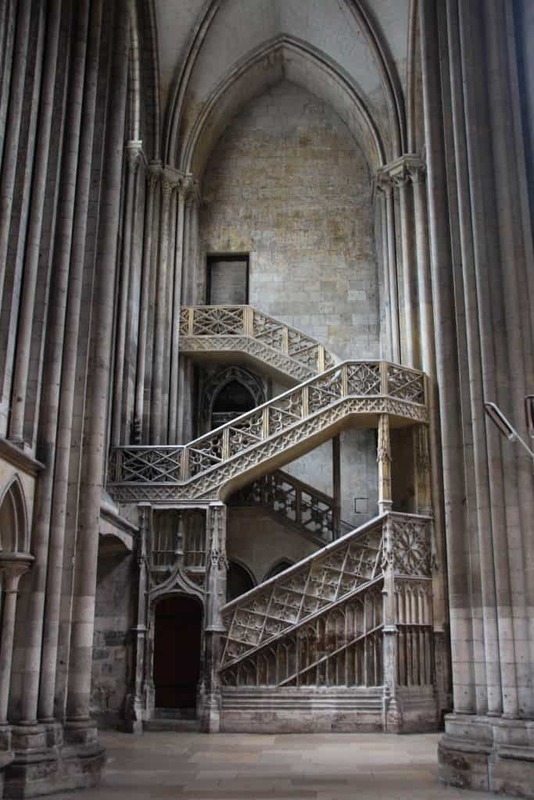 Don’t miss our Rouen with kids guide. You have a few options for parking. You can either choose to park in the city inside a parking garage or park outside the city and take public transportation into the city. If you choose to park at a daily garage, they will cost you around 14 euros per day. We tried to park at the Place du Vieux Marche garage (where the Rick Steves walk begins), but it was closed for construction, so we circled around and ended up a couple blocks down the road at the parking garage called Rouen Palais de Justice- Musee des Beaux-Arts. It is central to the sights in Rouen and also has a public library on the top floor of the parking garage pedestrian exit/entrance. We liked the use of the free bathrooms, they are to the right as you enter. Another option is to park in the “park and ride” lots located outside the city. If you take this option, it will only cost 1.70 euro each way to take the train into the city. 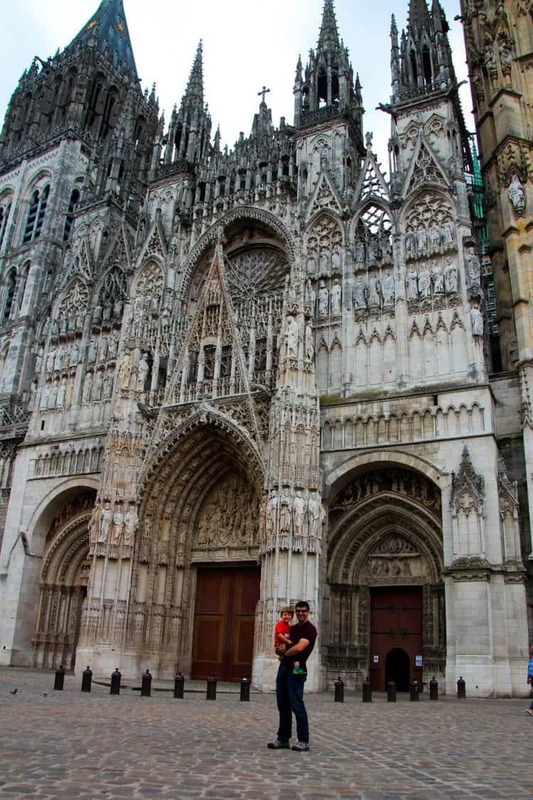 Is Rouen easy with kids? The whole city is easy to navigate with children due to its pedestrian zones, sidewalks and the majority of the sights are walking distance from each other. There are a few grassy parks with playgrounds scattered just outside the main downtown area. 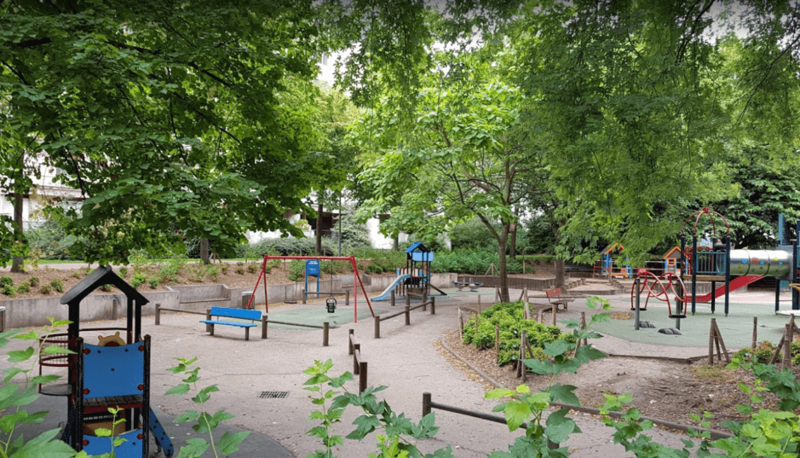 l’Hôtel-de-Ville Garden is another wonderful green space with a larger play area for little ones. 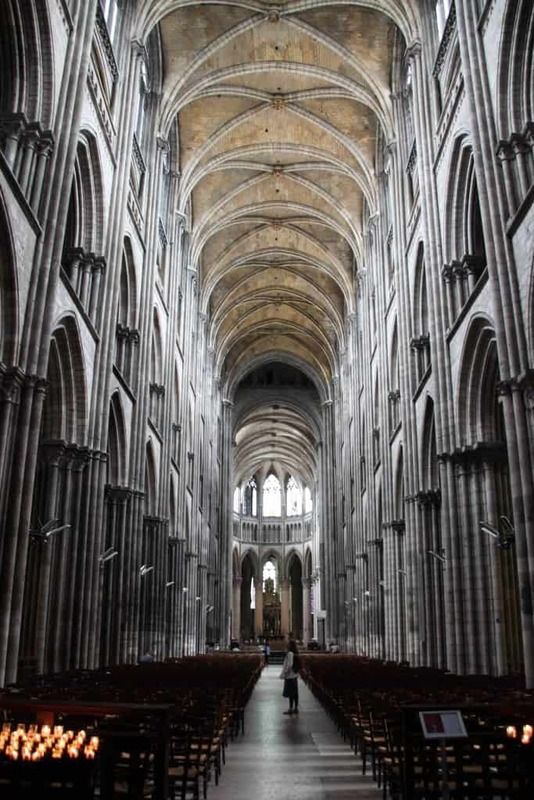 It is also located in the northern portion of the city and is adjacent to the Saint-Ouen Abbey Church. If you have the Rick Steves Normandy guide, check out his wonderful 1.5-hour walk through the city. Here are some of the highlights that you’ll cover. This is the starting point for your walk. The Joan of Arch Church was completed in 1979 and stands at the center of Place du Vieux-Marché. It was here in the square that Joan of Arc was burned at the stake for heresy in 1431. Built next to this site is the modern church dedicated in her honor. The design of the church is meant to reflect an upside down viking ship, not the wooden beams that bend towards the ceiling on the interior. 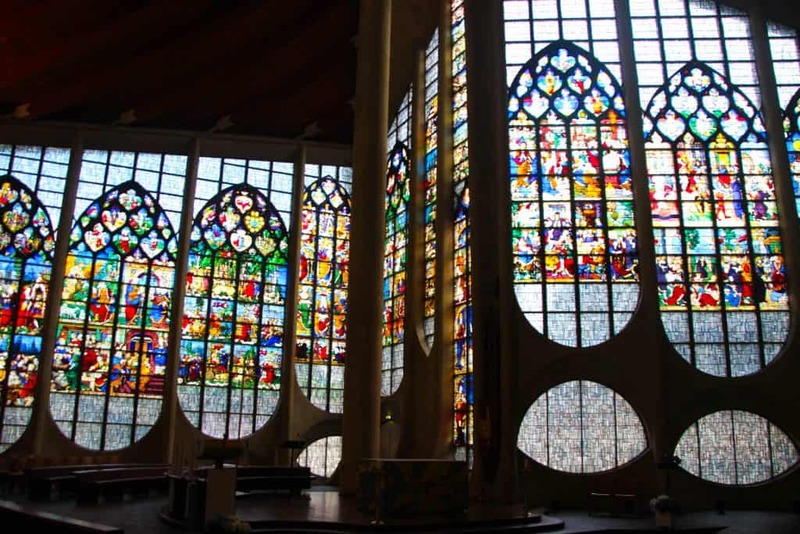 Inside, you’ll also discover huge stained glass windows which were originally house in a nearby 16th century church, which was destroyed in WWII. 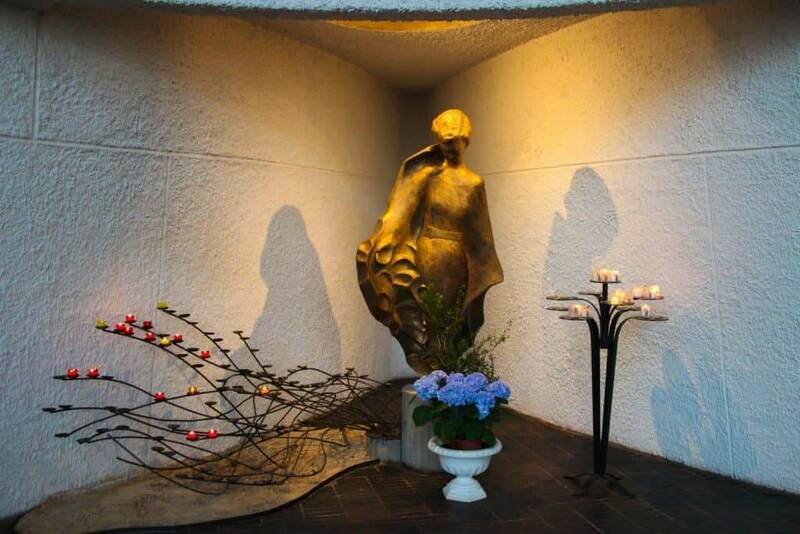 Be sure to visit the sanctuary of St. Joan of Arc. She is portrayed as a martyr with a beautiful statue and red candle holders echoing her untimely death. My husband and I took turns enjoying a peaceful look into the church and the stained glass windows while our son played on the ruins inside the courtyard. Just outside the church you’ll find informative plaques, an outdoor covered market and a tall cross statue to mark this famous church. 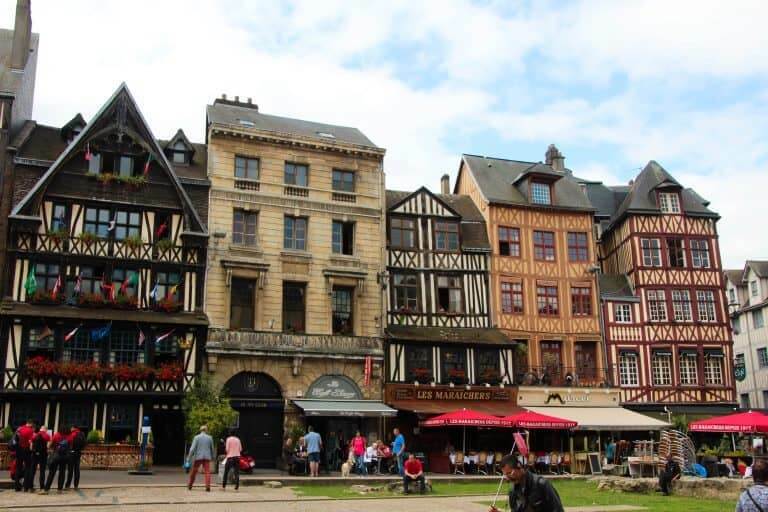 This is Rouen’s Old Market Place, or is better known as the spot where Joan of Arc ws burned at the stake in 1431. The Church of St. Joan of Arc dominates the square and there is a market hosted daily just across from the church in the covered market area. This market square is also the home of the famous restaurant La Couronne. This restaurant has become famous due to it’s tie to the American TV chef Julia Child because this is where she enjoyed her first meal in France and was introduced to French cuisine. 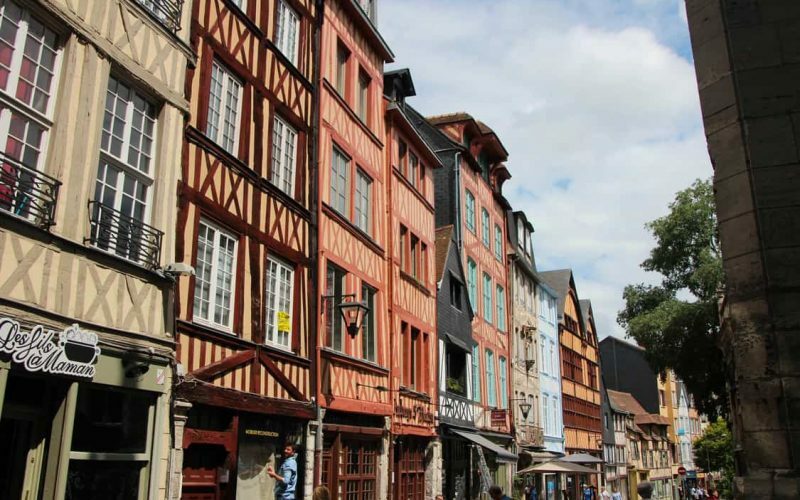 Be sure to explore the Place du View Marche and soak in the charm of the 1/2 timbered buildings. It is the perfect spot to take in a bit of people watching and there are plenty of tour groups strolling by. Now continue left and head down Place du Vieux Marché to check out Auzou Le Chocolatier Normand. 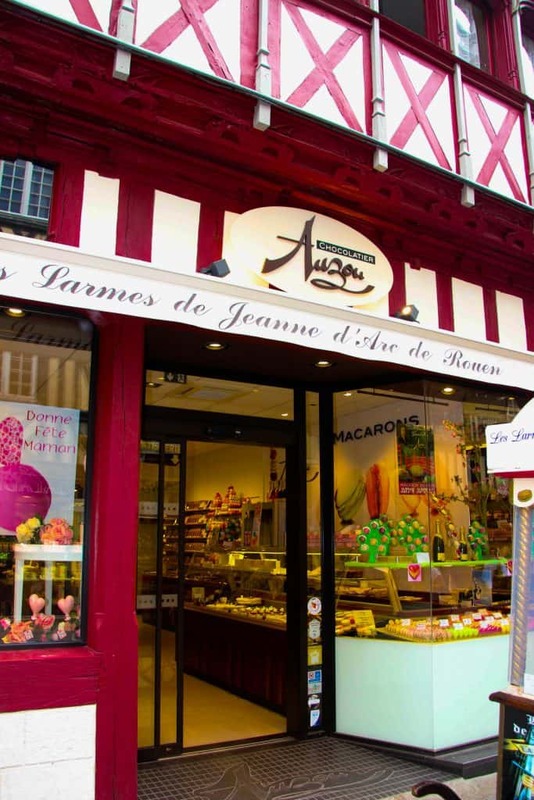 It is a well-known chocolate shop where you can buy Joan of Arc tears or chocolate covered almonds. Ask for a sample in the back. We purchased the macarons (a delight in France) and they didn’t disappoint. 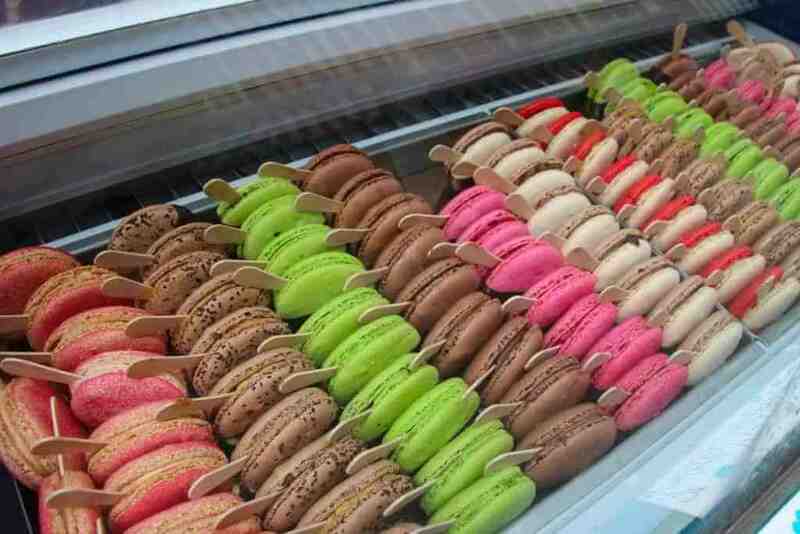 Fancy an ice cream macaron? They have plenty of flavors to choose from! As you continue to explore down the street, you’ll quickly find Le Gros-Horloge. It is a stunning 14th century astronomy clock in the old town of Rouen and one of the oldest clocks in France. 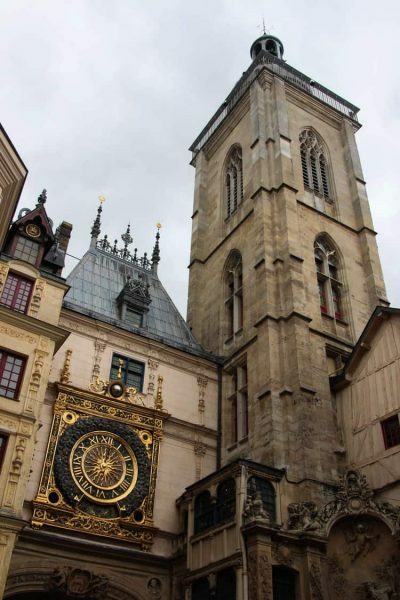 It features a double-sided clock along with a bell tower. Don’t forget to look at the sculptures on the underneath of the renaissance arch. You can also climb the clock tower for views of the city. From inside the tower, you can get a better view of the clock and you’ll notice the astronomical symbols as well as the phases of the moon. The dial is 2.50 meters in diameter. Then continue up to the top of the tower to view the 700 year old bells and look out over the top of the buildings. The clock tower is open every day except Monday from 10am-7pm, closed for lunch between 1-2pm. Shorter hours during the winter. Kids under the age of 6 are free, otherwise adults are 7 euros and children are 3.50 euros. There is an audio guide available for both children and adults. 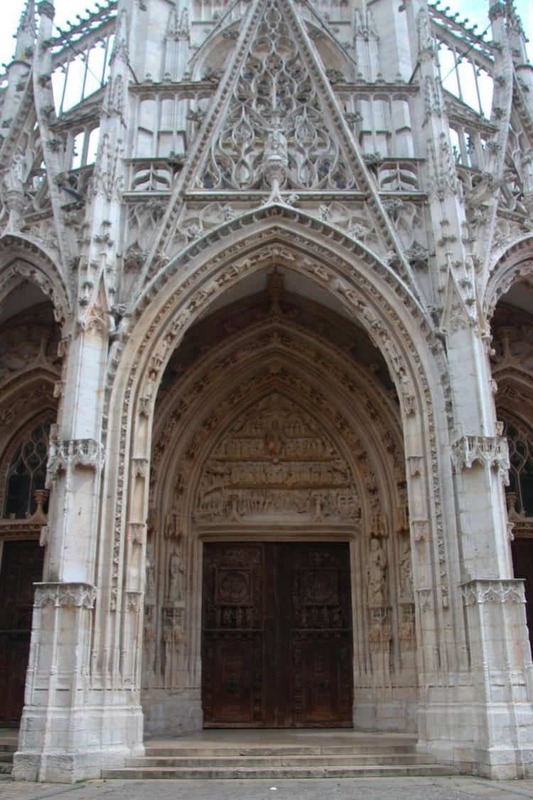 At the end of the street, you’ll run into the stunning Cathédrale Notre-Dame de Rouen. This famous Gothic cathedral has the tallest spire in France and is well known due to Monet’s love of painting this church. It is built on the site of a 4th century basilica and features a variety of architecture styles due to its destruction and reconstruction over the centuries of turmoil. It contains the tombs of Dukes of Normandy, the heart of Richard the Lionheart and was the site of Joan of Arc’s trial. It also features beautiful stained glass windows from the early 13th century. Tip: There are no entrance fees, so continue past the street beggars who sit with a donation box at the entrance. We’ve seen quite a few Cathedrals during our travels in Europe, but we loved this Cathedral. They had a nice display of photographs from WWII. This cathedral sustained quite a bit of damage during the bombings. The interior features a beautiful nave that soars four stories high. Be sure to see the stained glass in the St. Sever and St. Jean chapels. The upper sections are from the early 13th century (taken out of the church and protected). At the north end you’ll see the beautiful Bookseller’s stairway. It is absolutely stunning! 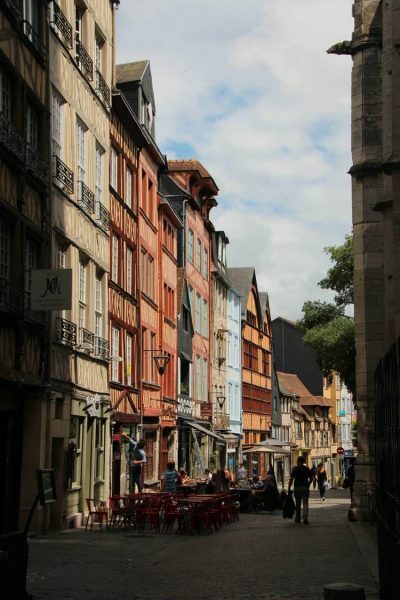 Just around the corner from the church and tucked down another icon Rouen street is the restaurant Le Saint Romain. The staff is lovely and the crepes were amazing with some hard cider. They sell bottles to go if you happen to love them as much as we did. Rouen was a charming town full of top sights! It is perfect for a 1/2 day visit and longer if you want to stroll the various streets or enjoy a bit of shopping. Interested in checking out more places to visit in the Normandy area? 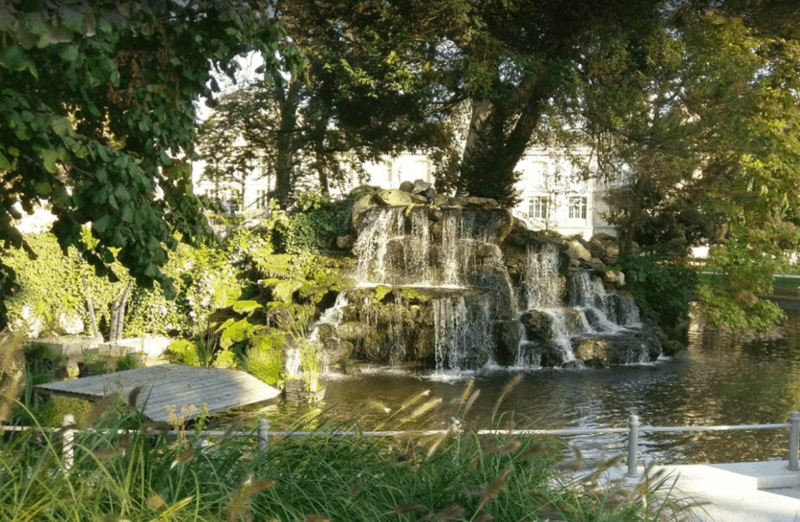 Head back to my Normandy with Kids guide! Want to explore other areas in Europe that we’ve visited? Head over to my destinations page to explore.